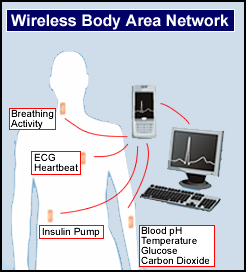 The Sensium is a wireless body monitoring technology that combines an ultra low power sensor interface and transceiver platform. It includes a reconfigurable sensor interface, digital block with 8051 processor and an RF transceiver block. In layman's terms, it is essentially a "smart band-aid" that can report the status of your body. 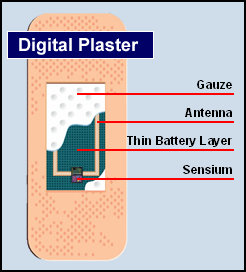 Several Sensium digital plasters can be applied to the body; all of them can be interrogated by a PDA or Smartphone. Together with an appropriate external sensor, the Sensium provides ultra low power monitoring of ECG, temperature, blood glucose and oxygen levels. It can also interface to 3 axis accelerometers, pressure sensors and includes a temperature sensor on chip. One or more Sensium enabled digital plasters continuously monitor key physiological parameters on the body and report to a basestation Sensium plugged into a PDA or Smartphone. The data can be further filtered and processed there by application software. Update 18-Jun-2009: Pricing information for this smart band-aid is now available under non-disclosure agreement from Toumaz Technology. End update. The expense would be weighed against the cost of repeated intervention when mere monitoring might be cheaper. "We not only have an aging society, but one that does not have healthy lifestyle," said Alison Burdett, director of technology for Toumaz. "There are increasing numbers of people with chronic ailments, and that's putting an enormous burden on health care systems worldwide." A similar device is still under development - see the RFID Diagnostic Sensors Read By RFID-Enabled Cell Phones. If we can have a smarter band-aid, how about one that is stickier; see Geckel Adhesive Has Gecko-Mussel Foot Power for progress in creating an underwater adhesive. Via Toumaz sensium and Startup puts wireless monitor on a band-aid.